"SO SORRY FOR THE LOSS OF MR HENRY!! I SURE MISS SEEIN HIM PASSIN BY MY HOUSE EVE"
"I will always remember Mr. Henry fondly. Obviously a well-respected man by many"
"He was a great man and even greater friend." "You were always a nice man. Rest In Peace - You Deserve It!" "Judge Lackey was a great judge, an even better person, and he was my friend. 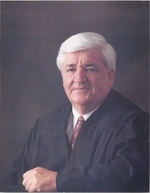 I "
"Judge Lacky was one of the kindest most honorable men. Always friendly and welco"
"May you be with God." Calhoun City. He was 83. Home in Calhoun City is in charge of arrangements. He was a member of First Baptist Church in Calhoun City for more than 70 years, and served as a deacon. He taught Sunday School for about 50 years. He and his friends played in a small band that entertained at nursing homes and at other benefit programs. chairman at the time he retired in December 2010. He left his mark on the judiciary with an unwavering commitment to judicial integrity. judges who stepped aside due to conflicts. He handled 45 cases as a senior status judge. ten-cent store in Calhoun City. in the U.S. Army in 1961 and 1962.
prosecuting attorney, and served a four-year term. authority to designate funds for public defenders. representing every kind of case that came through his door. Alumnus of the Year. He previously served on the Board of Trustees of Mississippi College. Office of Courts. He was preceded in death by his parents and two sisters, Geraldine Lackey Beavers and Hilda Hill. To send flowers to the family of Henry Lackey, please visit our Heartfelt Sympathies Store.